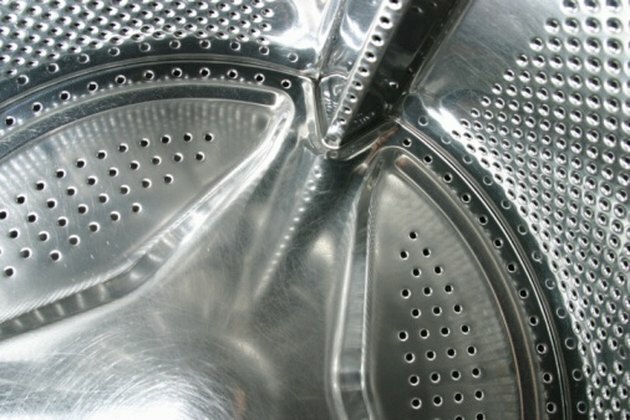 If you notice reddish-brown spots in your washing machine tub, rust is likely the problem. Rust can form for many reasons, including excessive iron in your water and rusty water pipes. Whatever the cause, removing rust from inside your washer is a must. If left untreated, rust can transfer to your laundry and spread further throughout the tub. If the tub becomes too plagued with rust, it not be able to be cleaned and will have to be replaced. Remove rust from your washer tub so it doesn't spread onto your clothing. Take everything out of the washing machine. Soak a sponge with white vinegar. Use the sponge to scrub the rust spots from inside the tub. Wipe down the tub with a rag and warm water to remove any residue. Set the washer to the hottest water setting and the largest load setting if there is still rust present. Add 2 cups of lemon juice to the washer and run a complete wash cycle. Wipe out the inside of the tub with a wet rag once the cycle is finished.